Does your cost per click go up and up? Maybe your AdWords budget can’t achieve the customer acquisition costs you want. This is getting out of hand. “PPC is getting more expensive year over year.” That’s what the “experts” are saying. It makes what you’re seeing with your own costs seem normal. But is it really? Or is it just getting more expensive for people who don’t understand how to use it effectively? Are more people using AdWords without learning the secret to maximizing their AdWords budget by keeping their CPC low? You don’t have to be a “so-called expert” to use AdWords. But there are some techniques and tips the pros use to maximize their AdWords ROI. Here’s how the pros get results while keeping costs low. Stop overbidding on keywords. It’s true some keywords are worth more to your company. But you have to look at the whole picture. That single CPC isn’t the only expense you have to acquire that customer. Overbidding is a drain on your AdWords budget you can’t afford. We’ll go into detail on that in the next section. Use analytics to determine which keywords have the highest conversion rate. Also, measure their value in terms of order size and lifetime value. Know when it’s worth it. If a keyword costs too much to get an excellent AdWords ROI, don’t bid more than you’re willing to pay. We’ll discuss some more cost-effective alternatives a little later. You can save as much as much as 400% over your competitors if you have a high score. We’ll discuss. AdWords has some great features that allow you to pay more to appear in searches at optimal times like time of day, on mobile devices, etc. But if you’re not careful, you end up paying twice for this prime placement. If you set several criterion for which you’re willing to pay more, you’re charged for each when multiple criteria apply. Be very selective with this feature. Consider how bid-stacking might occur. Know that paying twice the going bid for one criterion could end up being 10X what that click should have cost. Is it worth it? Normally, we’re all in favor of automation. But too much automation in AdWords will cause you to overbid. It can destroy your AdWords budget in a matter of days. Now what? Take some time. You may need a lot of it at first. But it does get easier. Manually set bids based on your ROI for that word. If you start out automated because you don’t have any data to fall back on, don’t fall into a trap. Revisit those bids once you have the data. They say “those who fail to plan, can plan to fail”. Entrepreneurs know it’s true. Yet many small businesses pay too much on CPC because they don’t have an AdWords budget or a plan. They come into it with this idea that they’ll do whatever it takes to acquire customers. They know that marketing costs money. So they don’t realize when they’re overspending. If you’re paying too much to acquire new customers, you won’t stay in business. An AdWords budget includes more than just the cost of a click. To lower that CPC, know the expenses involved and plan for them. Know what your expenses are. Begin allocating funds around them. In many cases, you’ll either be doing these things yourself of paying someone to do them. Either way, you know time is money. You can’t do everything yourself. It’s important to lay it all out on the table up front to avoid getting overwhelmed. An AdWords budget includes the following. Start by investing in planning and research. This should include looking at what your competitors are doing. What can you learn from them? What can you do better? How much you should spend in the various categories of your AdWords budget. What daily cap to set for your campaign. This is based on your conversion rate. Don’t convert more people than you can manage as a company, unless you’re prepared to expand fast. Evaluate all of this by looking at past campaigns, data and your competition. If you have limited data, you’ll still have a plan. Just modify it as you learn more. This is how much you’ll pay as a whole for clicks. Keep reading this article to learn more ways to cut this cost. And negative keywords you may need to add. A negative keyword is a word that would signal that the person performing the search really isn’t interested in what you offer. For example, let’s say you’re an accountant. You’ve targeted the keyword “Find an accountant”. You don’t someone who types “Find accountant software” to pull up your ad. But it might if you don’t have “software” as a negative keyword. This not only keeps you from paying for misclicks because they thought you were something else. It helps avoid damage to your AdWords quality score, which we’ll look at more in detail a little later. It’s often advantageous to buy software that saves you time. For example, there are paid tools that will tell you which keywords are performing best for your competition. You can swoop in and take those spots. Other tools like SEMrush and WordStream help you manage your campaign more effectively. They reduce unwanted clicks and help you keep your quality score high. The downside is that these tools often don’t make financial sense for a small business who’s only managing campaigns for their own business. That’s when working with an AdWords management agency is very helpful. They can spread the cost out while giving each client access to state-of-the-art technology that can blow the competition out of the water. Now that we’ve looked at creating an AdWords budget, it’s clear that your cost per conversion is more than just the cost of a click. Your costs include the click cost plus the other direct costs for the campaign like copy and wages. It’s also important to recognize that the average campaign has a lot of clicks that don’t convert. Or they don’t convert immediately. Spread the cost of these clicks among the clicks that actually converted. Your goal, over time, is to reduce the cost of these low conversion clicks as you increase your conversion rate. As you do, your cost per conversion goes way down. You can stay high level with your cost per conversion if you choose. But the more granular you get, the greater insight you’ll have into where to spend your money. Google AdWords provides you with the base data that factors in the cost of the clicks for your ads. You’re responsible for factoring added expenses. If the other campaign expenses stay rather stable during the campaign, just use AdWords cost per conversion calculation as a quick benchmark. This allows you to stay on top of this metric. See it rise and fall as you make changes to the campaign. It’s important to know that a small percentage of conversions don’t get tracked because the clicker didn’t allow cookies. It’s never good to make decisions without all the facts. But the simple truth is that some people don’t want to be tracked. If you think that Google AdWords is way off, you can do it manually like this. You may be thinking, “clicks just cost more in my industry. It’s really competitive.” This is true to an extent. But, with better keyword research, you can get these costs way down and still earn those clicks. Most often what you see when you use AdWords Keyword Planner is what people pay for keywords that have 2-3 words in them. A keyword is actually a phrase, not a single word. AdWords benefits by only showing you these short keywords because they’re more common and usually cost more. It makes it seem normal to pay $10 or $20 for one competitive keyword. But sometimes if you add a word or two to that keyword, you can make a long tail keyword. The cost goes way down because the long version is less common. But it still includes the keyword you want to target. If you have your campaign set to not be “exact match”, you’ll still show up in those searches if you keep your quality score up. You’ll just pay less to do so. Target people trying to do it themselves (eg. How to clean AC coils). This can work great for service providers. People start out wanting to do it themselves. They then decide it’s easier to call you. But be very careful with these. Your ad needs to appear relevant for the search and not mislead people. It’s true that you don’t pay with AdWords unless people click. So how bad your copy is may seem irrelevant to what the cost per click is. Poor ad copy will make the CPC go up. On the flip side, improving your copy lowers your CPC. Your AdWords budget will thank you. All of this leads to increased ad spend in your AdWords budget. AdWords sees that people aren’t clicking. Or they click and then leave. It begins to raise your CPC. We’ll discuss more about how it can do this a little later. For now, let’s focus on what makes great AdWords copy. Build it around the searcher’s objective, not what you sell. It should be clear what your company does. But this isn’t the focus of the ad. The searcher’s objective will vary based on which keywords you’re targeting. Align copy with the objectives associated with those keywords. Put numbers and acceptable symbols in your ad. People automatically think numbers are important. And symbols get attention. Eyes go right to them. If you can’t think of how to use numbers and symbols, Include an impressive stat. Most people love statistics. Leverage emotions. If you can make someone feel something with words, you just earned a click. Speak to entitlement. If you have a target that wants things “now” and “their way”, speak to this. That’s most of us, by the way. Speak directly to a target audience. Do this whenever possible. The more personalized you can make the ad copy, the better. Nothing can dig into your AdWords budget deeper than failing to recognize the importance of your website in a PPC campaign. Were you so focused on building your campaign that you forgot where that ad leads? People who do click won’t stick around if the site is slow, cluttered, or hard to navigate. Over 50% of searches now take place on a mobile device. 25% of people expect your site to load as fast on mobile as it would on a desktop. Not only are you losing a conversion opportunity. If your site isn’t user-friendly, AdWords knows that you provided a poor experience. They will increase your cost per click. Follow this checklist to avoid strain on your AdWords budget. For every second longer it takes a page to load, you lose about 5% of your visitors to abandonment. This means they leave without looking at or clicking on anything. 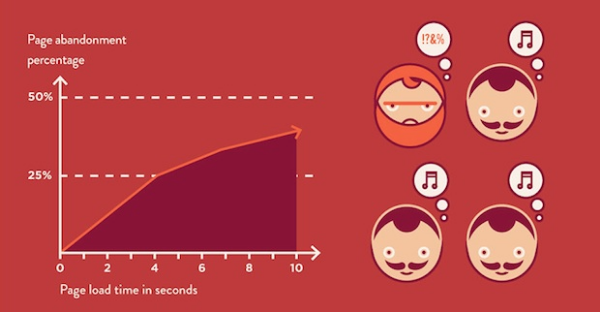 So if you have a 6-second load time, 25% of the clicks you paid for didn’t even really visit your website. This Fast Company graphic gives us a visual on that abandonment rate. Remove extemporaneous plug-ins. Optimize all of your images. Only use video if you can keep the site loading fast. 84% of AdWords landing pages have a menu. Yet removing it increases conversions by 100%. The page on which you ad click lands has one purpose — to convert. It shouldn’t have anything that distracts from that goal. Keep landing page copy relevant, concise and on point. 48% of landing pages have more than one offer. This causes choice paralysis. It lowers your conversion rate. When people click an ad, they’re usually ready to buy something. Don’t talk them out of it with too many options or too much information. Landing page congruency is particularly important. Let’s go there next. What is congruence? Congruence is a method that is hyper-focused on conversion rate optimization (CRO). Each landing page within that campaign is congruent (aligned) with the others to achieve that single goal. Anything on the landing page that isn’t congruent with that single goal is removed. Conversion software thought leader Oli Gardner with Unbounce calls it “reducing friction”. Having anything on the page that isn’t clearly aligned with your goal causes friction. That friction slows down or even stops a would-be conversion. It disrupts the natural path of a customer. It causes disharmony that people don’t just experience. They feel it in a tangible way. If you were skating down a hill filled with potholes and speed bumps, how much longer would it take you to get to the bottom? Might you even decide not to go down that hill because of all of the friction on the way down? This is how customer’s feel on non-congruent landing pages. But when you have congruent landing pages, your conversion rate goes up significantly. As it does, AdWords notices. They lower your CPC. The CPC portion of your AdWords budget just keeps shrinking. And over time your AdWords budget will shrink even further with congruence. When all landing pages for a PPC campaign are aligned to a single goal, you can more use effectively use analytics. Easily see what’s working best where and when. When you’re congruent, you can compare “apples to apples”. You just can’t do that when incongruency exists. We discussed removing menus and multiple CTAs in the last section. But this goes further. Get started with these simple steps. Each campaign has 1 goal. Know what it is. You’ll build everything else around it. Landing pages should be congruent with the ad as well as each other. You may have many ads in an ad group that take a slightly different angle toward 1 goal. But your landing page should always seem like a seamless extension of the ad. The ad references a special deal. The landing page immediately tells them how to redeem it. Any images should clearly align with the ad and other landing pages. If it’s clickable, it should take a person to the same place the CTA takes them. Mentioning anything that isn’t clearly relevant to the goal is completely out. Read it and read it again. Let someone else review it. It’s amazing how much incongruency can exist without your realizing it. They should be able to redeem it with a single click on the CTA. In AdWords, the quality score tells you how relevant your ads are in the searches in which you appear. If your ad isn’t relevant, it either won’t get clicked, Or it gets clicked by the wrong person. Keeping this score up is very worth your while. 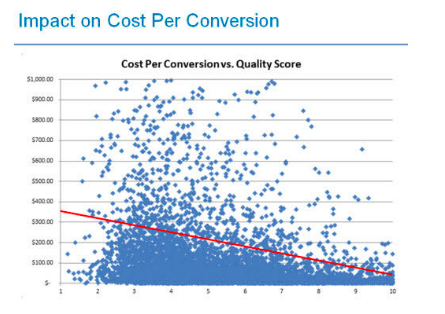 Just look at the correlation between quality score and what you pay as indicated in this WordStream Graphic. Having a 10 score instead of a 1 saves almost 80% on clicks. Having a high score says that Google AdWords believes that you are providing a good user experience to their searchers. If you aren’t they try to bury your ad by charging you so much for a click that you can’t afford to pay it. Yet, many businesses don’t realize this. They pay these insanely high costs thinking it’s normal. Relevance of your keywords in their ad groups — If people don’t click on your ad, it appears that it was irrelevant for that search. Because of this historical component, it takes some time to “fix your score”. Have you been running campaigns and ignoring your quality score? It’s a lot like trying to repair your credit score. It doesn’t happen overnight. If it’s really bad it may take weeks or months of amazing performance to show AdWords you’ve changed your ways. Again, it’s worth the investment to fix it. Here’s another helpful WordStream graphic that makes that point. The quality score helps level the playing field for small business. Focus on quality. You can do more with a small business budget than a huge business can with their massive marketing budgets. Both AdWords and social media ads are amazing for small business. They each have their strengths and weaknesses They can work together to connect with more people and increase conversion rates for both. But some companies find that to keep costs low, they prefer to switch to just social media advertising. Don’t think you’ll escape the power of the quality score though. Facebook Advertising also uses a relevance score to determine which ads to show and how much you’ll pay. But, for the most part, it’s easier to understand and improve. Social media advertising helps you reach a target audience through demographic and behavioral data rather than keywords. Some find this easier to work with than a keyword based advertising. To lower your CPC and maximize your marketing budget, it may be the way to go. Are you paying too much to acquire customers? Apply these techniques to lower costs. Have a written budget. Don’t overpay for keywords. Understand what a quality score is and how to get it up. Stop overpaying on PPC. Get help managing your AdWords campaign, cut costs and grow your business. That’s what we do. Contact us today!